Aliens in the Attic is a 2009 American family science fiction comedy film produced by 20th Century Fox and Regency Enterprises and starring Carter Jenkins, Austin Butler, Ashley Tisdale, Gillian Vigman, Andy Richter, Doris Roberts, Robert Hoffman, Kevin Nealon, Tim Meadows, Henri Young, Regan Young, Josh Peck, J. K. Simmons, Kari Wahlgren, and Thomas Haden Church. The plot revolves around the children in the Pearson family having to defend their vacation house against a group of aliens planning an invasion of Earth until one of the aliens betrays them and joins the Pearson children in battle. The film was previously titled They Came from Upstairs, which is instead used as the film's tag line. A video game of the same name was released as well. Aliens in the Attic received mixed reviews from film critics but was a minor box office success. However, Rotten Tomatoes gave it a rating of 31%. The film was directed by John Schultz. A meteor shower rockets through open space. Four glowing pods are seen hiding behind the meteor shower. Suddenly the meteor shower makes a hard right and heads towards the distant planet Earth. In a Chicago suburb, Stuart Pearson (Kevin Nealon) and his wife Nina (Gillian Vigman) head a family that includes 7-year-old Hannah (Ashley Boettcher), 17-year-old hormonal sister Bethany (Ashley Tisdale), who has just come back from a secret outing with her boyfriend Ricky Dillman (Robert Hoffman), and 15-year-old techno-geek Tom (Carter Jenkins) whose high school grades are low. After having an argument with Tom about him hacking into the school's website to change his grades and deciding the family needs some good old-fashioned togetherness, Stuart takes them to a holiday home in the middle of nowhere. Joining them is Nathan "Nate" Pearson (Andy Richter), his 14-year-old son Jake (Austin Butler), Nana Rose (Doris Roberts), and identical 12-year-old twins Art (Henri Young) and Lee (Regan Young). Ricky also arrives unexpectedly and talks his way into staying overnight, by giving them the impression that his car has broken down and needs to be repaired (though he secretly took out one of the plugs) so he can spend time with Bethany, plus saying he is 18 years old. As the family settle in, dark storm clouds swirl around the house. Suddenly, the four glowing pods land on the roof. 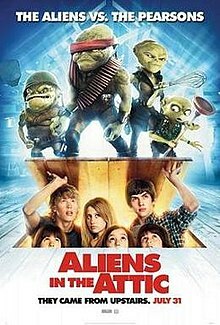 An alien crew emerges, made up of Skip (J. K. Simmons), the nasty, tough commander, Tazer (Thomas Haden Church), a muscle-bound dude armed to the teeth, Razor (Kari Wahlgren), a lethal, violent female alien soldier, and Sparks (Josh Peck), a four-armed techie, who is the only non-threatening intruder. Since the aliens crashed into the satellite dish, Ricky and Tom are sent to fix it. In the attic Ricky then reveals to Tom that he lied about his car breaking down, and his age; Ricky is actually in college and is 21 years old, four years older than Bethany. Ricky sends Tom to fix the satellite dish by himself, but it is beyond repair. Investigating further, Tom and Jake (who unexpectedly shows up on the roof) discover the aliens. Ricky is shot by Tazor with a dart-like "mind control plug", allowing the aliens to control him via a remote. The aliens, called "Zirkonians", lay claim to the planet. Like a puppet, Ricky attacks the boys, but Tom and Jake manage to get back into the house. It is not long before all five kids have seen the aliens, except for Bethany. They soon discover that the alien mind control plugs don't work on children, giving them a fighting chance, and realize they have a responsibility to protect the adults by keeping the aliens' existence a secret. The kids create makeshift weapons, like a homemade potato spud gun, and repel the first alien attack from the attic. In the process, they obtain Ricky's remote control and turn him against the aliens. The kids orchestrate a scheme to get the adults out of the house and then ambush the aliens as they try to reach the basement via the air vents, causing the gentle tech Sparks to become separated. He meets Hannah and they become friends. Unlike his alien cohorts, Sparks hates battle; he just wants to return home to his family, and he helps by making weapons for them. He also reveals his teammates are after a machine buried under the basement for many years. The kids forgot about their grandmother, and the aliens mind control her, which gives her superhuman strength and agility but they obtain her controller, and she defeats Ricky (now back under alien control) in a scene reminiscent of a fighting ninja video game. However, the aliens manage to capture Jake and Sparks, whom they need to complete their mission. The kids finally reveal to Bethany the events that are taking place. The five of them rescue Jake in the basement. Ricky then insults Tom and the others and breaks up with Bethany because she always talks about feelings and family, and leaves. The children attack the aliens and rescue Sparks but Skip succeeds in using the enlarging machine, growing to 30 feet tall, and calls the Zirkonian invasion ships. They defeat him and shrink him again. Tazer and Razor (who have fallen in love) flee, while Skip is sucked into the machine, which was damaged in the process and malfunctions and explodes. Sparks calls off the invasion and returns home after saying goodbye. Tom and Stuart reconcile and the rest of the vacation goes back to normal, except the kids grew closer to each other during their adventure. In the distance Skip, who has been shrunk to an even smaller size than before, appears bent on revenge, but meets his demise when a crow flies over and grabs him. In a mid-credits scene, Bethany and Tom take revenge on Ricky for breaking up with her and insulting her family by making him look like a fool in front of his new girlfriend Annie Filkins, using the alien mind control device. Bethany comments "I am so keeping this" after using the device to make Ricky land on his testicles. The script was written by Mark Burton and Adam F. Goldberg. The film is co-financed by Fox and Regency while being distributed by Fox. Fox snapped up the script in March 2006. Marc Resteghini was overseeing for Fox while Kara Francis Smith shepherds for Regency. Barry Josephson was confirmed as the main producer while Thor Freudenthal was hired to direct principal production. The principal production began in March 2007. The film was originally titled They Came from Upstairs but later changed to Aliens in the Attic while the first title is instead used as the film's tag line. Ashley Tisdale's involvement in the film was confirmed in January 2008 as she was cast as Bethany Pearson. Robert Hoffman, Carter Jenkins and Austin Butler were later cast in the film. Doris Roberts was signed on to the film in February 2008. MTV confirmed that Josh Peck joined the cast as the voice of the alien Sparks. John Debney composed the original score for the film. Tisdale recorded a song titled "Switch" for the film, which is also included in her second album, Guilty Pleasure. The original motion picture soundtrack was released on August 18, 2009. Principal photography began at the end of January 2008 in Auckland, New Zealand. Auckland-based production company New Upstairs Productions said filming would run for 30–40 days from January 28 to April 18, 2008 with no filming in weekends. The film was set in a rambling old villa transported from Remuera to a farm in North Auckland. The main set was an old manor and they spent $700,000 restoring the house. The main shooting ended in mid-March 2008. Tisdale, Butler and Jenkins went back to the set to shoot last-minutes scenes for the film in April 2009. The film was released on July 30, 2009, in Russia and Malaysia; July 31, 2009 in United States, Canada, and Bulgaria; August 12 in the United Kingdom; September 3, 2009 in Australia. The film's original release date was in January 2009 but it was pushed back for unknown reasons. The UK release also coincided with a charity auction for Save the Children which teamed up with eBay and 20th Century Fox where various celebrities, including several actors from the movie, sold items from their attics to raise money for the charity. Reviews of Aliens in the Attic were mixed to negative; the film holds a 31% "rotten" rating on Rotten Tomatoes based on 71 reviews, with the consensus stating "Inoffensive and kid-friendly, this mundane family comedy is light on imagination." Metacritic gives the film a score of 42 based on 10 reviews. Entertainment Weekly described the film as "a pointless and harmless family adventure that doesn't mentally assault the 12-and-over set and looks like a lot of fun", while San Francisco Chronicle has described the movie as being unoriginal and crowd pleasing. Variety stated the film doubtless would appeal primarily to a more narrow demographic of tweens and pre-teens and despite Tisdale's presence, it’s difficult to imagine many ticket buyers between the ages of 12 and 18 while The New York Times described Jenkins and Butler as the actors with more personality and Hoffman as the actor who provides the film’s occasional funny moments and stated that even though she is credited as one of the main characters, Tisdale spends most of the film off screen. The Los Angeles Times said the film is "an enjoyable kid-friendly film but not an out-of-this-world classic" and also mentioned the film belonged to Hoffman and Kirk Honeycutt of The Hollywood Reporter said the director John Schultz played everything for laughs and earns a more than a few but tech effects deliver a fair number of those laughs and described the film as an "amusing family comedy". Radio Times gave the film a three out of five stars rating, saying that the film is "a thrilling children's yarn with enough pop-culture references to hold grown-ups' interest". The Dove Foundation praised the film, saying it is "one of those movies that you find to be better than anticipated" and also said the film draws on realism in family dynamics. Lara Martin of Digital Spy described the film as a "kid-friendly mix of Men in Black crossed with Gremlins with a healthy dose of Home Alone-style violence" and also mentioned that one of the biggest disappointments in the movie is the lack of screen time given to Tisdale, billed as one of the leading actors, who "gets a promising start as she rebels against her parents and struts around in her bikini, but she's quickly relegated to background fodder purely there to provide excess opportunities for the alien-controlled Ricky to shine" and concluded saying it seems "a bizarre and sad waste of her obvious comedic talent". However, The Miami Herald gave a mixed to negative review, saying the film is a "children's movie mix of live-action and animation, it has a few positive messages, a few laughs and a few comic throwdowns". Aliens in the Attic was a minor box office success. In the United States, the film was distributed by 3,106 theaters and grossed $8 million its opening weekend, resulting in No. 5 in the box office. The film grossed the equivalent of US$1.3 million in Russia, US$10 million in the United Kingdom, and a total of US$57 million worldwide total. The film was released on DVD and Blu-ray on November 3, 2009. A video game based on the film was released on August 4, 2009, developed by Revistronic and published by Playlogic. The game features the storyline of the film and is available for Wii, PlayStation 2, Nintendo DS and Microsoft Windows. The game also offers players two different gameplay perspectives depending upon which video game platform players choose. The game allows the player to play as Tom, Hannah, Jake, Art, Lee, Bethany or The Four Alien Explorers across 15 levels. ^ a b c d Box Office Mojo. Aliens in the Attic. ^ a b "Aliens in the Attic". Turner Classic Movies. Retrieved April 19, 2016. ^ a b c d Kit, Borys. "Tisdale climbs to film in "Upstairs"". The Hollywood Reporter. Archived from the original on July 18, 2008. Retrieved 2008-01-12. ^ a b c "Fox Heads 'Upstairs' With Burton". Variety. March 2, 2006. Retrieved January 12, 2008. ^ a b LaPorte, Nicole (January 22, 2007). "Freudenthal to Direct 'Upstairs'". Variety. Retrieved January 12, 2008. ^ Doris Roberts Signs On 'They Came from Upstairs'. Variety.com. ^ Josh Peck Heads Out Of This World For Ashley Tisdale's Sci-Fi Flick 'Upstairs' MTV.com. Retrieved March 4, 2009. ^ Aliens in the Attic: Soundtrack. Amazon.com. ^ "Tisdale set to join "They came from Upstairs"". Archived from the original on January 11, 2008. Retrieved January 12, 2008. ^ a b Shepheard, Nicola. "Hollywood Movie Filming at Auckland Manor". The New Zealand Herald. Retrieved January 12, 2008. ^ "NZ's Just What She's Been Looking For". The New Zealand Herald. Retrieved January 12, 2008. ^ Back to 'Aliens in the Attic' Set[permanent dead link]. Ashleytisdale.com. Retrieved on 2009-07-14. ^ Vena, Jocelyn.Ashley Tisdale Hones Alien-Fighting Skills In 'They Came From Upstairs'. MTV.com. Retrieved on 2009-08-15. ^ "Aliens in the Attic Movie Reviews, Pictures". Rotten Tomatoes. Retrieved March 8, 2012. ^ "Aliens in the Attic". Metacritic. Retrieved March 8, 2012. ^ Markovitz, Adam (July 31, 2009). "Aliens in the Attic". Entertainment Weekly. Retrieved December 2, 2017. ^ Hartlaub, Peter (August 3, 2009). "Movie review: 'Aliens in the Attic'". The San Francisco Chronicle. ^ Leydon, Joe (July 31, 2009). "Aliens in the Attic". Variety. Retrieved December 2, 2017. ^ Hale, Mike (July 31, 2009). "Earth in Peril, Children to the Rescue". The New York Times. Retrieved December 2, 2017. ^ Whipp, Glenn (August 9, 2009). "'Aliens in the Attic'". Los Angeles Times. Retrieved December 2, 2017. ^ Honeycutt, Kirk (July 31, 2009). "Aliens in the Attic -- Film Review". The Hollywood Reporter. Retrieved December 2, 2017. ^ Staunton, Terry. "Aliens in the Attic". Radio Times. ^ Aliens in the Attic – Movie Review Archived November 25, 2009, at the Wayback Machine. The Dove Foundation. ^ Aliens in the Attic – Movie Review. Digital Spy. ^ Aliens in the Attic – Movie Review. The Miami Herald. ^ "Movie Aliens in the Attic – Box Office Data, News, Cast Information". The Numbers. August 14, 2009. Retrieved August 16, 2009. ^ Teen Choice Awards Nominees Archived July 25, 2011, at the Wayback Machine List of Nominees. ^ Young Artist Awards Nominees Archived October 12, 2013, at the Wayback Machine List of Nominees. ^ "Aliens in the Attic Video Game". Archived from the original on July 7, 2009. Retrieved July 2, 2009.